Taskfeed Categories provide a visual way of identifying or organizing your Tasks. When you create a Category you also define a colour and a label. When a Task is given a particular Category, a coloured label is displayed on the task on the Board, the Inbox, and the Due Date views in the Taskfeed tab. Implementation (green), Client Action Item (red) and Event (blue) are Taskfeed Categories created for this Org. 1. Navigate to the Taskfeed Categories tab from the App Launcher in Lightning Experience or All Tabs in Classic. 2. Click New to create a new Category. 4. Enter a Color name or a hexadecimal code (HEX). We recommend choosing from this list of colour names which will be supported by Taskfeed. 5. Check the Active box to activate your Category. Inactive Categories won't be available in the Category dropdown list on the Task. 6. Optionally, enter a Description, and click Save. In order to deactivate an existing Category or activate/deactivate new Categories, Salesforce Administrators must add the Active field to the Taskfeed Category page layout. From the management settings for the Taskfeed Category object, go to Page Layouts. Open the Taskfeed Category page layout. Drag the Active field in the Fields section of the palette onto the page. Can I assign a Category to Tasks from a template? 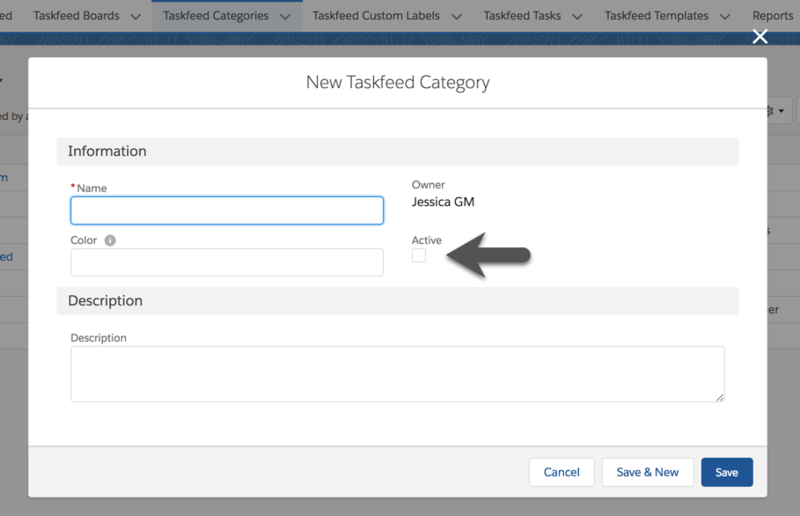 Taskfeed Admin Users: Tasks can also have a corresponding Category predefined in a Task Template. Create a Category column on the task Template source file to enter a Category name (predefined in the Taskfeed Categories tab) for any task on a Task Template.